If it weren&apos;t for the constant pain I&apos;ve developed below my left shoulder blade, I wouldn&apos;t have given up my standby work bag for anything. Black leather cut in a schoolboyish shape with gold hardware and a long strap that I slung over my shoulder, it was so perfect. So cool. The sinking feeling that I was destroying my back at the age of 22 was not. Enter the Backpack That Saved My Life And Also Looked Good, Too. 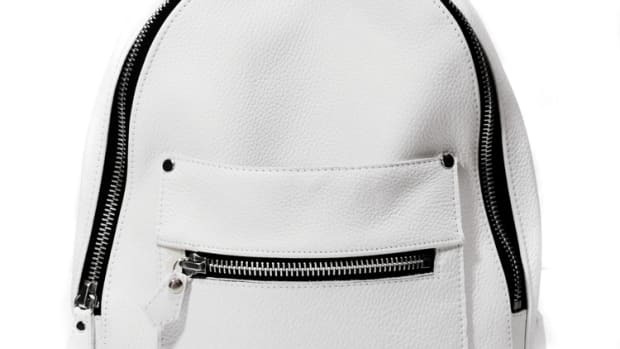 After scouring various skate shops and men&apos;s stores for a backpack that was sleek and a little masculine but also reasonable to bring along to meetings with fashion people, I found this Herschel bag. Yes, it is the official carry-all of 20-somethings who live in my particular borough of New York City and is the sartorial equivalent of drinking beer out of mason jars, but you know what? The laptop pocket has padding. I can fit my gym shoes, makeup bag and a change of clothes in it. With its slate gray color and clean shape, it always makes me think of a tombstone, which is both funny and symbolic -- the death of my back pain. I&apos;ll drink a craft beer to that. Herschel backpack, $79.95, available at Tactics. Have I finally found the perfect backpack? Maybe not, but I really like this one. While living in New York provides us with above-average shopping opportunities, there are those certain stores that only exist in Europe, leaving us longing for their wares. Whistles is one of those stores. You know it's worth it when your boss tells you your hair looks good.